As we enter the colder months and weed growth is at its slowest for the year, now is the time to both revitalise our property weed control plans, and maintain and repair spray equipment ready for spring. A weed control plan is a useful way to assess priorities and develop an efficient plan of attack. Without an effective plan the task of controlling weeds can seem overwhelming. This weed talk will discuss a practical approach to developing a weed control plan;, where to start, and how to put in place an ongoing strategy for managing weeds. Weeds can cause serious damage to natural ecosystems, reduce farm productivity and profitability, and seriously limit the long-term sustainability of natural resources. Weeds can increase fire risk, (think gorse and sweet pittosporum) increase costs to infrastructure maintenance, reduce the amenity of recreation areas and directly contribute to the decline of some native wildlife. Some weeds also have serious effects on both human and animal health. Weeds have significant economic, environmental and social impacts. Minimise the ability of weeds to establish by good farm and garden practices. Minimising disturbance to native vegetation and soils. Plant gardens with plants that don’t have the potential to become invasive (check out the weed lists on the weeds page of this website). Regularly monitoring bushland and restoration sites for weed infestations. 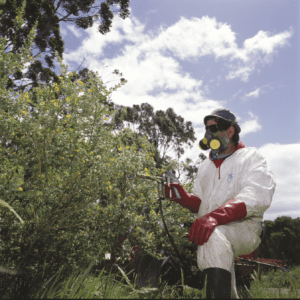 Avoiding fertiliser use and run-off into areas of bushland as weeds favour these high nutrient loads. Cleaning vehicles, equipment and footwear that have been in contact with weeds to prevent weed seed transfer. Do this in an isolation area that is regularly monitored. An ounce of prevention is worth a pound of cure (or the metric equivalent). Control weeds before seeds set. Weed management on a property can be substantially improved by approaching the task with a plan. A well thought-out plan that takes a strategic approach can make weed management tasks easier, more achievable and can result in significant savings of time, effort and money. “What do I want to achieve”. We all hope that total eradication is possible every season, but I don’t know anyone who achieves this. Weed control is an ongoing task. Is your creek or riverside your priority? Is your shade and shelter plantings or remnant bush a priority for you? Its OK to set goals like all the ragwort I can find and blackberry totally removed from the creek side, and then work with the neighbour to control the English ivy on the boundary. Identify what weeds are present on your property. Often there will be multiple weeds to deal with so it is important to get identification of the weeds sorted. There a quite a few look alikes; know what can be left and what requires a good dose of herbicide. Several similar looking weeds need quite different approaches. For instance Californian thistle needs a different herbicide to shore or spear thistle, which can also be mechanically controlled. An aerial map of your property can easily be marked to show weed infestations and will assist in prioritising weed control actions. Many SGLN members have done an iFarm course. You can use the mapping tools to have a weed control layer. This helps remind you where your priority areas are, and also serves as a record of the work you have done. When out and about on your property you may stumble across a weed plant. Most of us have a smart phone in our pockets. You can use a GPS app to help you by saving weed waypoints. These files can be exported to your iFarm program, or viewed on Google earth. Once you know what weeds you have you can assess the weeds develop a plan of attack. For instance, some weeds may not warrant control in the short-term, while others may require urgent attention. For example, in spring ragwort rosettes are the priority whilst blackberry can wait until it flowers, later on in the season. Here are some guidelines to determine the best approach to controlling weeds on your property. What is causing the problem? Weeds are often a symptom of another problem such as nutrient input, inappropriate burning practices, disturbances, overgrazing or a nearby infestation source such as garden waste dumping. Be realistic about the extent of your weed infestation. Would it be prudent to get a weed control professional to do the first spray of the season? These people are skilled and have the right equipment to efficiently spray larger areas. If you are a weekender or have physical limitations it can make a great deal of sense. Consider how much time and effort you will be expending. If a professional can do the same job in 2 hours, it might be very cost effective. You can do the follow-up spraying throughout the rest of the season. Can the same control method be applied to more than one weed? For example, you may be able to spray both ragwort and thistles with the same spray mix. Weeds don’t recognise property boundaries and effective control may require the cooperation of a number of landholders. Talk to your neighbours. What will be the impact of the weed removal? Is it on a stream bank with potential for erosion? Will it remove habitat for some species? How much follow up maintenance or additional rehabilitation of the site will be required? This is quite important to consider when controlling willows for example. As a rule, commence work from the least affected area, and as weeds are controlled, move into the more infested areas. Start at the top of the catchment and work down-stream for weeds in or along watercourses. Break your site up into small manageable stages; use physical features such as tracks and creeks and fences to define boundaries. Hygiene is important – keep equipment clean and free from material which can spread weeds. If you use a hay contractor for instance, ask about their biosecurity procedures. Match the control method to the life-cycle and habitat preferences of the weed. We had talked about the correct time to spray blackberry. During the early spring, older plants are using root reserves to grow. Because they are not translocating from the leaves to the roots, spaying is not very effective at this time. In summer, just as they are flowering gives the greatest chance of success. Small plants without well-developed root systems can be sprayed at any time during the growth phase. Document your control methods and assess your success. Stay vigilant, continue to monitor and keep an eye out for, and control, any re-infestations or new weed incursions. A lack of follow-up weed control is the most common reason why weed management projects fail. The weeds pages of the SGLN web site has lots of resources to help you plan your weed program, with ID information and weed control calendars and control method advice.